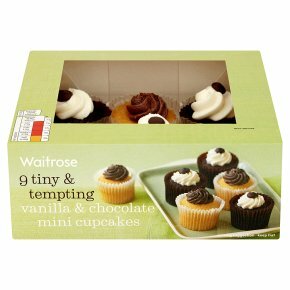 Five mini chocolate cupcakes with vanilla flavoured frosting and dark chocolate button. Four mini vanilla cupcakes with chocolate frosting. INGREDIENTS: sugar, water, rapeseed oil, wheat flour fortified (wheat flour, calcium carbonate, iron, niacin, thiamin), humectant (vegetable glycerine), palm oil, invert sugar syrup, wheat glucose syrup, fat reduced cocoa powder, butter (milk), dried free range egg, tapioca starch, milk whey powder, dark chocolate button (sugar, cocoa mass, cocoa butter, emulsifier (soya lecithin), flavouring), cocoa powder, milk proteins, wheat starch, raising agents (disodium diphosphate, sodium hydrogen carbonate), skimmed milk powder, coconut oil, Belgian chocolate (cocoa mass, skimmed milk powder, sugar, fat reduced cocoa powder, emulsifier (soya lecithin), flavouring), wheat protein, flavourings, emulsifiers (propane-1;2-diol esters of fatty acids, polyglycerol esters of fatty acids, mono- and diglycerides of fatty acids), preservative (potassium sorbate), flavouring.